Enjoy being located in the centre of Budapest and go shopping on Vaci Street or in the Market Hall or take a short walk beside the River Danube. The national museum is worth a visit as well and is only seconds' walk away from the hotel . The Hotel has a swimming pool and a sauna for you to unwind after a long day exploring Budapest. Benefit from free WiFi access through the entire hotel. Enjoy shopping on Vaci Street or in the Market Hall or take a short walk beside the River Danube. 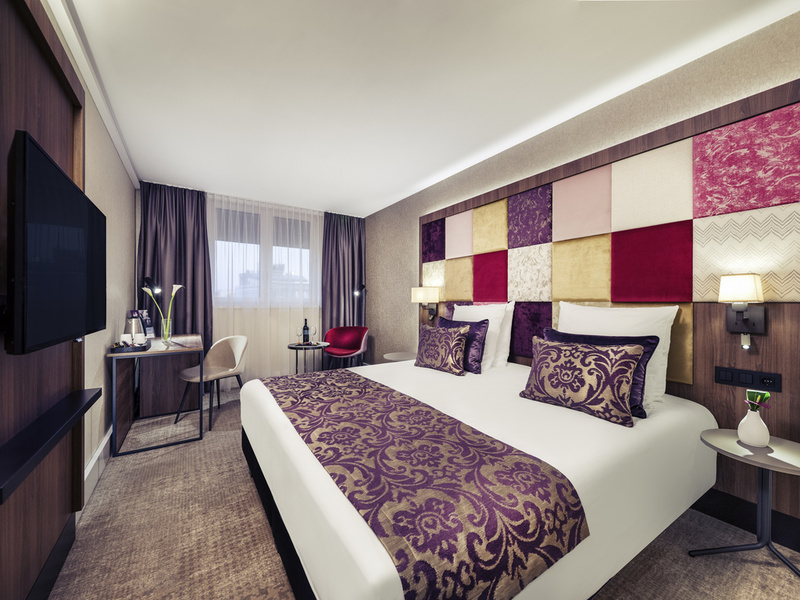 416 rooms: you can choose from Standard, Privilege Rooms, Suites and Deluxe Suites to ensure your full comfort. Coffee & tea making facilities are prepared in the guestroom. All rooms are equipped with free WiFi. Upgrade your standards and enjoy our extra Privilege services such as private breakfast area in an exclusive ambiance, 3 hours snack time, 10% discount on Hotel services and extra bathroom amenities. Start your day with exclusive Privilege breakfast, enjoy Snack time in modern atmosphere, take your dinner in relaxing ambiance and...My Bridge Lounge will change your mood for the whole day. Villány-Tokaj Restaurant is open for delicious and healthy buffet breakfast (with Market, Bakery, Fit Bar and Hungarian surprises) in the mornings and also offers a splended opportunity for hosting events (Gala dinners) around 250 persons. My Bar will ensure perfect location for business and private talks with modern and trendy design. Wide variety of coffee specialties and drinks await our guests as well as a pleasant atmosphere. Faultless service with very friendly staff. The receptionist were all very courteous and professional and gave us perfect information about the hotel & places to visit. Our room was beautifully decorated with everything we'd want for a few days stay. We had a privilege room and the Privilege Lounge breakfast and snack time was definitely worth the extra money to experience them. The staff in the lounge were welcoming and very happy to talk about Budapest. The snacks and drinks were plentiful, a welcome break after a days sightseeing. The bedrooms and all areas of the hotel were immaculately clean, with rooms refreshed daily. Nice location close to the Danube river. The hotel has been partially renovated and our Privilege room was comfortable for a family of 3. Our daughter got her space separated from the main bedroom. Though the bathroom was small. The staff was friendly and the breakfast served with a wide choice of products. I strongly recommend. A pleasant hotel in the heart of the city with a very good breakfast. Book in advance to spend less money. It was nice to have a seat at the bar in glass corridor between two bouildings, drink red wine and watch the live city. The beds are very comfortable. The elevators need to be faster. They should work on one button, i.e. not to go to the same floor at the same time both. Good hotel near the city centre. Great accomodation and excellent breakfas, very plesent stuff. Oniy complaint I have on smelly staircase. I was in the room 834 On the positives: my room was very calm (could sleep very well) & clean as recently renovated; also, the personnel was very kind & professional, the morning buffet was large and offered a great variety of food. On the negatives: my room was visible from another side of the hotel, so I had to keep the curtains closed & the sight was certainly not great compared to the beauty of Budapest; besides, the elevated floor made it difficult in the morning to get quickly an elevator to go down to the restaurant floor or to the front desk at ground 0 (1 day there was even only 1 elevator working and it really took me 5 to 10min to finally go down to the front desk). My overall feeling is mitigated because of the high price (similary to West-European cities) while some hotels in this Budapest areas would offer a similar experience for a lower price. Putting aside the price aspect, my overall feeling tends to be positive. The location of the hotel is good and the staffs are friendly. I paid for a privilege room. The room was great as was the breakfast. My only issue was not knowing what was included in my room and what would be an extra charge if I used it. I would have appreciated clarity on that. Outside of that I totally enjoyed my stay. I like this hotel because of location, however it seems like every time they are under reconstruction, this time one elevator not working, so had to wait too long, total floor was under reconstruction, the restaurant also, so only one place to eat dinner, ?? ?I was looking for improvement on pool and spa, but nothing has been changed since one year ago, very strange working opening hours, man at the pool not friendly at all ? ?This must be improved ! Clean, welcoming and great location. Lovely fragrance in reception. Welcomed the complimentary water in the room each day. Having to get 2 lifts (which were a bit slow) to 4th floor was a little inconvenient. Enjoyed our stay. Great location, everything functions smoothly. Coffee-machine and tea kettle in the room make you feel comfortable. Nice room. Bad odoor from bathroom. The staff cleaning tabels at breakfast lacked some service in Getting clean forks and knives. We were in room Block B 469 immediately opposite the elevator which meant we were disturbed often during the night with the lift doors opening and closing as other guests returned. Most of the staff we encountered were an absolute delight, and really elevated the vibe of the hotel. There were a couple of exceptions though, such as housekeeping entering the room twice without knocking. The facilities within the room were, initially, very impressive, but were let down by working insufficiently - the windows could not be opened and air conditioning was nowhere near enough to control the heat in the room. The Nespresso machine was an exciting sight for weary travellers but unfortunately it did not work. The breakfast, and MyBridge bar were classy, comfortable, and well presented. The pool area was a bit less streamlined, and seemed quite rough around the edges compared to the rest of the shared spaces in the hotel. It was also very disappointing to close early on a Sunday afternoon, all the way through til 4pm Monday. This meant we couldn't use the pool for half of our total stay, but was not mentioned at the time of booking or we would have sought out a hotel with better pool opening hours. Nice clean hotel, central to every where. Staff were friendly and always available to help. Breakfast was ok, please sort out your tea/coffee machine. I had high hope's for this trip as it was for my sons 21st birthday. The rooms were dirty, in particular the carpet. The bathroom bin was full when we arrived. The aircon wasn't on because it was &quot;only March&quot;. The &quot;warm&quot; food at breakfast was cold, the coffee machines broke frequently and the tables were left dull of dirty breakfast plates. There was refurbishment going which if I'd had known I would have booked another hotel.